Anderson, James W. The Real Issue: An Analysis of the Final Lincoln-Douglas Debate. Lincoln Herald 69 (Spring 1967): 27-39. Angle, Paul M., ed. Created Equal? The Complete Lincoln-Douglas Debates of 1858. 1958. Reprint. Chicago: University of Chicago Press, 1985. Ankrom, Reg. Stephen A. Douglas: The Political Apprenticeship, 1833-1843. Jefferson, NC: McFarland & Company, Inc., 2015. Auchampaugh, Philip G. The Buchanan-Douglas Feud. Journal of the Illinois State Historical Society 25 (April-July 1932): 5-48. Bell, George William. The Early Career of Stephen Arnold Douglas. Ph.D. dissertation, Boston University, 1911. Brown, William Garrott. Stephen A. Douglas. Boston: Houghton, Mifflin Co., 1902. Capers, Gerald Mortimer. Stephen A. Douglas: Defender of the Union. Edited by Oscar Handlin. Boston: Little, Brown Co., 1959. Carr, Clark Ezra. Stephen A. Douglas, His Life, Public Services, Speeches and Patriotism. Chicago: A.C. McClurg Co., 1909. Clinton, Anita. Stephen Arnold DouglasHis Mississippi Experience. Journal of Mississippi History 50 (June 1988): 56-88. Coleman, Charles Hubert. The Lincoln-Douglas Debate at Charleston, Illinois, September 18, 1858. Charleston: Eastern Illinois University, 1957. Collins, Bruce. The Lincoln-Douglas Contest of 1858 and Illinois Electorate. Journal of American Studies 20 (December 1986): 391-420. Davis, Granville D. Douglas and the Chicago Mob. American Historical Review 54 (April 1949): 553-56. Davis, Rodney O., and Douglas L. Wilson, eds., The Lincoln-Douglas Debates. Urbana: University of Illinois Press, 2008. Dean, Eric T., Jr. Stephen A. Douglas and Popular Sovreignty." The Historian 57 (Summer 1995): 733-48. Dennis, Frank L. The Lincoln-Douglas Debates. New York: Mason Lipscomb Publishers, 1974. Dickerson, O.M. Stephen A. Douglas and the Split in the Democratic Party. In Proceedings of the Mississippi Valley Historical Association for the Year 1913-1914, vol. 7, edited by Benjamin F. Shambaugh, pp. 196-211. Cedar Rapids, IA: Torch Press, 1914. Douglas, Stephen A. A Brief Treatise Upon Constitutional and Party Questions, and the History of Political Parties. Edited by James Madison Cutts. New York: D. Appleton Co., 1866. Ericson, David F. Stephen A. Douglas, Slavery, and Pluralist Democracy." In The Shaping of American Liberalism: The Debates Over Ratification and Slavery, pp. 117-35. Chicago: University of Chicago Press, 1993. Eyal, Yonatan. With His Eyes Open: Stephen A. Douglas and the Kansas-Nebraska Disaster of 1854." Journal of the Illinois State Historical Society 91 (Winter 1998): 175-217. Fehrenbacher, D.E. The Historical Significance of the Lincoln-Douglas Debates. Wisconsin Magazine of History 42 (Spring 1959): 193-99. ___. Lincoln, Douglas, and the Freeport Question. American Historical Review 66 (April 1961): 599-617. Felt, Thomas E. The Stephen A. Douglas Letters in the State Historical Library. Journal of the Illinois State Historical Society 56 (Winter 1963): 677-91. Fretz, Barbara Catharine. The Changing View in History, with Special Reference to the History of Stephen A. Douglas. Ph.D. dissertation, Cornell University, 1938. Goodspeed, Thomas Wakefield. Lincoln and Douglas: With Some Personal Reminiscences. Journal of the Illinois State Historical Society 26 (October 1933): 183-201. Greeman, Elizabeth Dix. Stephen A. Douglas and Herschel V. Johnson: Examples of National Men in the Sectional Crisis of 1860. Ph.D. dissertation, Duke University, 1974. Guelzo, Allen C. Houses Divided: Lincoln, Douglas, and the Political Landscape of 1858." Journal of American History 94:2 (September 2007): 391-417. ___. Lincoln and Douglas: The Debates that Defined America. New York: Simon & Schuster, 2008. Hansen, Stephen, and Paul Nygard. 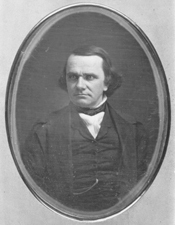 Stephen A. Douglas, the Know-Knothings, and the Democratic Party in Illinois, 1854-1858. Illinois Historical Journal 87 (Summer 1994): 109-30. Harmon, George D. Douglas and the Compromise of 1850. Journal of Illinois State Historical Society 21 (January 1929): 453-99. ___. Out-of-State Influences and the Lincoln-Douglas Campaign of 1858. Journal of Illinois State Historical Society 59 (Spring 1966): 30-47. ___. Political Fortunes of Lincoln and Douglas in 1858-59. Lincoln Herald 67 (Winter 1965): 161-70. Herriott, F.I. Senator Stephen A. Douglas and the Germans in 1854. In Transactions of the Illinois State Historical Society for the Year 1912, Illinois State Historical Library publication no. 17, pp. 142-58. Springfield: Illinois State Historical Library, 1912. Holzer, Harold, ed. The Lincoln-Douglas Debates: The First Complete, Unexpurgated Text. New York: HarperCollins Publishers, 1993. Howland, Louis. Stephen A. Douglas. New York: Charles Scribners Sons, 1920. Huston, James L. Stephen A. Douglas and the Dilemmas of Democratic Equality. Lanham: Rowman & Littlefield, 2007. Jaffa, Harry V. Crisis of the House Divided: An Interpretation of the Issues in the Lincoln-Douglas Debates. 1959. Reprint, with new preface. Chicago: University of Chicago Press, 1982. Jaffa, Harry V., and Robert W. Johannsen, eds. In the Name of the People: Speeches and Writings of Lincoln and Douglas in the Ohio Campaign of 1859. Columbus: Ohio State University Press, 1959. Jeffrey, Kirk, Jr. Stephen Arnold Douglas in American Historical Writing. Journal of the Illinois State Historical Society 61 (Autumn 1968): 248-68. Johannsen, Robert W. Americas Little Giant: Stephen A. Douglas. Civil War Times Illustrated 13 (April 1974): 18-29. ___. The Frontier, the Union, and Stephen A. Douglas. Urbana: University of Illinois Press, 1989. ___. The Lincoln-Douglas Campaign of 1858: Background and Perspective. Journal of the Illinois State Historical Society 73 (Winter 1980): 242-62. ___. Stephen A. Douglas. 1973. Reprint, with new preface. Urbana: University of Illinois Press, 1997. ___. Stephen A. Douglas, Harpers Magazine, and Popular Sovereignty. Mississippi Valley Historical Review 45 (March 1959): 606-31. Also included in Johannsen, The Frontier, the Union, and Stephen A. Douglas. ___. Stephen A. Douglas, Popular Sovereignty and the Territories. Historian 22 (August 1960): 378-95. ___. Stephen A. Douglas and the South. Journal of Southern History 33 (February 1967): 26-50. Also included in Johannsen, The Frontier, the Union, and Stephen A. Douglas. ___, ed. The Letters of Stephen A. Douglas. Urbana: University of Illinois Press, 1961. ___, ed. The Lincoln-Douglas Debates of 1858. New York: Oxford University Press, 1965. Johnson, Allen. Stephen A. Douglas: A Study in American Politics. 1908. Reprint. New York: Da Capo Press, 1970. Kester, Martha. Stephen A. Douglas: A Biographical Study. Masters thesis, University of Illinois, 1953. King, Willard L., and Allan Nevins. The Constitution and Declaration of Independence as Issues in the Lincoln-Douglas Debates. Journal of the Illinois State Historical Society 52 (Spring 1959): 7-32. Lynch, William O. The Character and Leadership of Stephen A. Douglas. In Proceedings of the Mississippi Valley Historical Association, vol. 10, pt. 3 (1920-1921), pp. 454-67. Cedar Rapids, IA: Torch Press, 1923. Malin, James C. The Motives of Stephen A. Douglas in the Organization of Nebraska Territory: A Letter Dated December 17, 1853. Kansas Historical Quarterly 19 (November 1951): 321-53. ___, ed. F.H. Hodders Stephen A. Douglas. Kansas Historical Quarterly 8 (August 1939): 227-37. Meerse, David E. Origins of the Douglas-Buchanan Feud Reconsidered. Journal of the Illinois State Historical Society 67 (April 1974): 154-74. Mering, John V. Allies or Opponents? The Douglas Democrats and the Constitutional Unionists. Southern Studies 23 (Winter 1984): 376-85. Milton, George Fort. Douglas Place in American History.Journal of the Illinois State Historical Society 26 (January 1934): 323-48. ___. The Eve of Conflict: Stephen A. Douglas and the Needless War. 1934. Reprint. New York: Octagon Books, 1963. ___. Stephen A. Douglas Efforts For Peace. Journal of Southern History 1 (August 1935): 261-75. Morrison, Michael A. Slavery and the American West: The Eclipse of Manifest Destiny and the Coming of the Civil War. Chapel Hill: University of North Carolina Press, 1997. Includes a chapter on Douglas and the origins of the Kansas Nebraska Act. Nevins, Allan. Stephen A. Douglas: His Weaknesses and His Greatness. Journal of the Illinois State Historical Society 42 (December 1949): 385-410. Pratt, Harry E. Stephen A. Douglas, Lawyer, Legislator, Register and Judge: 1833-1843. Lincoln Herald 51 (December 1949): 11-16; 52 (February 1950): 37-43. Quitt, Martin H. Stephen Douglas and Antebellum Democracy. New York: Cambridge University Press, 2012. Schapsmeier, Edward L., and Frederick H. Schapsmeier. Lincoln and Douglas: Their Versions of the West. Journal of the West 7 (October 1968): 542-52. Seymour, Glen Huron. An Analysis of the Political Principles of Stephen A. Douglas. Ph.D. dissertation, University of Illinois at Urbana-Champaign, 1929. Sigelschiffer, Saul. The American Conscience: The Drama of the Lincoln-Douglas Debates. New York: Horizon Press, 1973. Smith, Howard William, Jr. The Early Public Career of Stephen A. Douglas. Ph.D. dissertation, Indiana University, 1963. Sparks, Edwin Erle, ed. The Lincoln-Douglas Debates of 1858. Springfield: Trustees of the Illinois State Historical Library, 1908. Stenberg, Richard R. An Unnoted Factor in the Buchanan-Douglas Feud. Journal of the Illinois State Historical Society 25 (January 1933): 271-84. Stevens, Frank E. Life of Stephen Arnold Douglas. Journal of the Illinois State Historical Society 16 (October 1923-January 1924): 247-673. ___, ed. Autobiography of Stephen A. Douglas. Journal of Illinois State Historical Society 5 (October 1912): 323-42. Stevenson, James A. Lincoln vs. Douglas Over the Republican Ideal. American Studies 35 (Spring 1994): 63-89. Taft, Robert. The Appearance and Personality of Stephen A. Douglas. Kansas Historical Quarterly 21 (Spring 1954): 3-33. U.S. Congress. Memorial Addresses on the Death of Hon. Stephen A. Douglas. 37th Cong., 1st sess., 1861. Washington: Government Printing Office, 1861. Weatherman, Donald Van. Partisanship and Principles in the American Party System: A Study of the Pamphlet War Between Stephen A. Douglas and Jeremiah S. Black. Ph.D. dissertation, Claremont Graduate School, 1978. Willis, Henry Parker. Stephen A. Douglas. Philadelphia: G.W. Jacobs Co., 1910. Zarefsky, David. The Lincoln-Douglas Debates Revisited: The Evolution of Public Argument. Quarterly Journal of Speech 72 (May 1986): 162-84. ___. Lincoln, Douglas, and Slavery: In the Crucible of Public Debate. Chicago: University of Chicago Press, 1990.